New evidence in support of the oceans-on-Mars theory has surfaced from a very spectacular source: geological deposits associated with tsunamis have been mapped on the red planet. 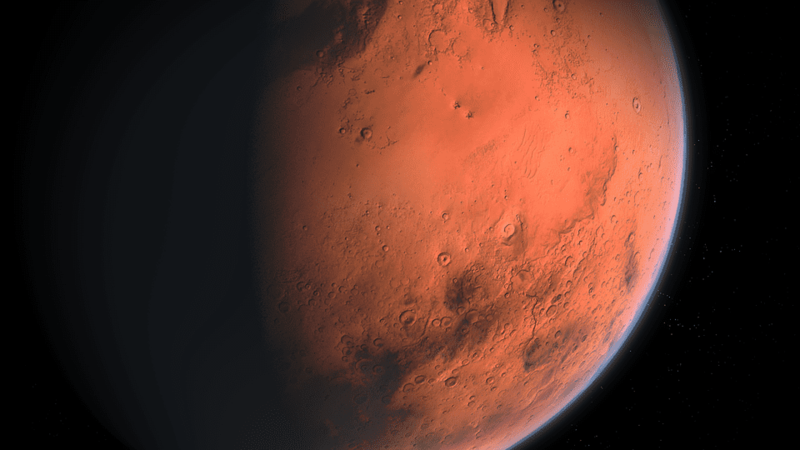 Scientists are fairly certain that at some point in the past, Mars held liquid water. But a more controversial topic is how much of it there was — namely, if Mars ever had oceans on its surface. A new paper published by an international team of researchers comes to support the idea that oceans did in fact once grace the face of Mars in style: with tsunamis. “We found typical tsunami deposits along the dichotomy between the northern hemisphere and southern hemisphere of Mars, it supports that there was, at that time, a northern ocean,” Francois Costard, PhD, researcher at the Université Paris-Sud 11, Orsay Earth Science Department and director of research at the French National Center for Scientific Research (CNRS) and first author of the paper said of the sediment distribution on the northern plains of Mars. These structures are known as lobate flow deposits and were first sighted by the Viking orbiters in the early days of martian research. They’re basically piles and piles of large rocks and other geological debris stacked below cliffs, with characteristic shape and topography. The deposits in the area the team was investigating (Vastitas Borealis Formation) were previously theorized to have been formed by mud volcanoes, glacier movement, or mud flows. But the characteristics displayed by the lobade deposits are suspiciously similar to what you’d expect to see when a tsunami hits high-land and all the stuff it’s been moving anchors itself on the terrain. “These lobate deposits propagate uphill from the northern plains and do so in close association with a potential palaeo-shoreline,” explains co-author Stephen Clifford from the Lunar and Planetary Institute in Houston, Texas. The team believes the tsunami originated in what today is the Lomonsov crater in Mars’ Norther District, generated after a massive meteorite impacted in the middle of the ocean. The team believes waves as high as 150m followed the impact — suggesting that there was ample free water to be stirred by the asteroid, which can only mean an ocean. Image credits Francois Costard et al., 2017, JGR. The Lomonsov crates is a 120km-wide bowl named for 18th century Russian polymath Mikhail Vasilyevich Lomonosov. Its size suggests a very powerful impact, and the team believes it created two sets of waves. This first wave was an estimated 300m in height, and likely reached the paleo-shoreline of hills and plateaus in a matter of hours, depositing the lobate flows. “It was a really large-scale, high speed tsunami. At the very beginning, a crater of 70km in diameter was created by the impact. This expelled a huge volume of water, with wave propagation at 60m/second,” Clifford adds. It’s likely that oceans housed the earliest of Earth’s life, so finding one on Mars would definitely improve the chances of life (at least, life as we know it) developing on the planet. And if there was once abundant water on our red neighbor, maybe it found a way to hold on until today. 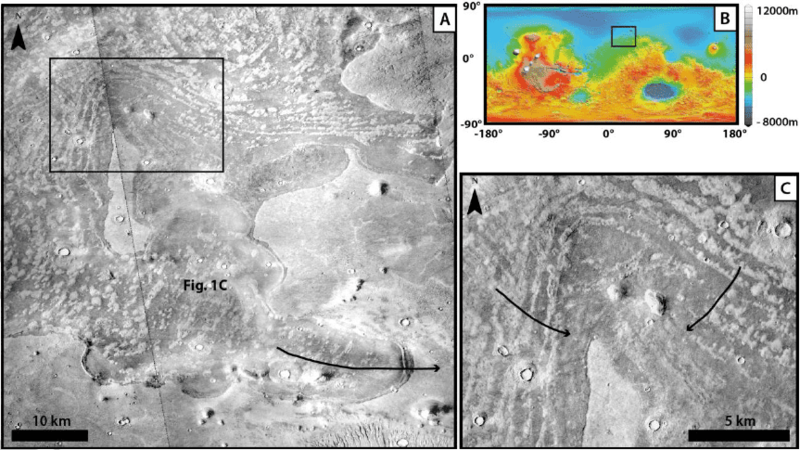 The paper “Modeling tsunami propagation and the emplacement of thumbprint terrain in an early Mars ocean” has been published in the Journal of Geophysical Research.